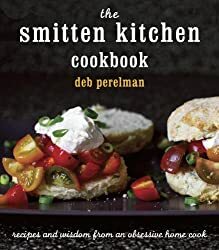 The Smitten Kitchen food blog is my favourite food blog and has been for many years so when Ms Perelman announced that she was going to release a book, I knew I would eventually buy it. Most of my cookbooks were sourced from a book surplus site which is more discounted than Amazon. However, I bought this book full price from Amazon.ca because I knew I would love it. Food and Cookbooks are in general very subjective. With the praise the blog and cookbook got, some people didn’t see the appeal. I think you will get the author, writing, and style, or you won’t. Thankfully for me, Perelman’s food and writing style seem right up my and many other people’s alleys. As always, mileage varies, but this is a rave for me. The Smitten Kitchen blog is a thoughtful food blog. I find the recipes consistent and delicious. I have made more recipes from her blog than any other blog. In fact, I wonder if the blog has been my number one in terms of online resources. The popularity of the blog means there are many comments which are helpful with the recipes too. Very few of the recipes from the blog have failed me. When I first browsed this cookbook, the only downside I got from the book is that it seemed to be a level higher than the recipes on the blog. By which I mean, part of Smitten Kitchen’s appeal is that there are recipes which are easy peasy and accessible alongside more adventurous home cook ones. All her recipes have a twist, but the book’s recipes are, on average, more elaborate and fancier. More suited to entertaining than home meals. Many of the recipes had big servings/portions for the recipe (many are for 6-10 people) This is understandable because this a book, but when I want dinner ideas, I go through the blog and other sources before this book. I wanted this to be that. On this proper reading of this book, I loved it more and more. It is entertaining and there were many lovely photos of recipes. I marked almost every recipe for the future. I find myself picky on the salads and sandwiches I would make, but I loved so many of them here. I enjoy the flavours of her recipes, plain and simple. Prose and Writing: Wonderful. Full of anecdotes and candid stories. Technique and Teaching: Lots of tips including information on how to make many of the recipes ahead. She also includes ingredients on how to make a round challah which is important for me even though I love the four plait. Photography and Layout: As featured in her blog, but even better in this book. I love how many photos there are. Other Book Notes: Deb had blogged that the binding of the book to lay flat was important. Geat feature. Usefulness Factor: 4.5/5 – Some very useful homecook tips. Inspiration Factor: 5/5 – I aspire to be like author in the way she cooks, bakes, and eats. Cranberry Crumb Bars with Mulling Spices – I forgot the cornflour but it was still great. Took it to a party and had to steal some for myself before people ate them all. 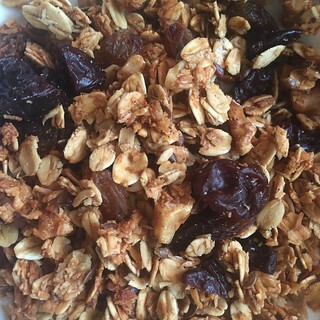 Big Cluster Maple Granola – Did not have enough cherries or walnuts, so I adjusted it slightly. Added some raisins. I replaced the toasted wheat germ with toasted flax seed. No sugar reduction. My clusters weren’t big at all, but the flavour works and I can definitely adapt this recipe for the future. Great with my homemade kefir. Next time: Have less than 100g of dried fruit but keep everything else as is in the recipe. 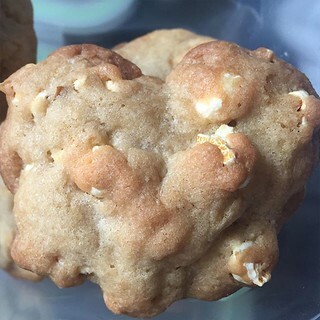 Buttered Popcorn Cookies – I think I only got about 15 cookies because I made them big. The popcorn gets a bit soggy the next day which was a bit since I had to make them in advance for an event. However, they eat well because it’s a standard chocolate chip kind of cookie batter, but instead of chocolate chips, you have buttered popcorn. It brings this salty note which is really nice. I would lessen the popcorn and add some chocolate chips as well next time. Overall: I love this cookbook. I would buy it again and can’t wait for future ones from the author. The whole of this recipe can be completed in the single bowl of a food processor. And instead of zesting and juicing many lemons, you just use one. All of it: the zest, the skin, and the flesh. Ground with sugar, butter, eggs, salt, and a bit of cornstarch, it bakes into the very best layer of lemon custard you could possibly imagine. 1. Place a rack in middle of the oven and preheat your oven to 350 degrees. Cut two 12- inch lengths of parchment paper, and trim each to fit the bottom of an 8- inch square baking pan. Press the first sheet into the bottom and up the sides of your pan in one direction, then use the second sheet to line the rest of the pan, running it perpendicular to the first sheet. Lightly butter exposed parts of parchment or coat them with a nonstick cooking spray. Set the pan aside. 2. Make the crust. Blend the flour, sugar, and salt together in the work bowl of a food processor. Add the butter and pulse until the mixture is powdery, but if firmly pinched, will hold the pinched shape. Turn the dough crumbs into the prepared baking pan and press the dough evenly across the bottom and about ½ inch up the sides. Prick the dough all over with a fork and bake for 20 minutes, or until lightly browned. Should any parts bubble up, gently prick them again with a fork. Leave the oven on. 3. Make your filling. Cut your lemon in half, and here’s where I need us all to be, briefly, quite fussy. Cooking Notes: Most recipes for whole lemon desserts recommend Meyer lemons. I actually prefer these with regular old grocery store lemons; with some modifications (described above) should their skins be extra thick, I find that they have the perfect balance of tart and fragrance. Nevertheless, to make these bars with Meyer lemons, use just one (of similar size and weight) and reduce the sugar to 1 cup (200 grams). You can double the recipe and bake it in a 9-by-13- inch pan as well. This recipe is amazing if you love lemons. I loved the taste of it and it’s worth the effort I made. Food Processor strongly recommended, but I did not have one. I grated the butter and used a pastry blender. I don’t think I needed to grate it for the crust and make it as I would other shortbread or a shortcrust. After I used my brand new mandolin, I used an immersion blender for the sugar and lemon part. That worked well, but when I added the shaved butter, the blender did not like that. If I did this again without a processor, I think I could get away with whisking and the pastry blender. I used about 200g of sugar for the filling because I ran out of sugar. I could have cut it even more for my tastes since I like it tarter and less sweet. As usual, I opted out of using the parchment and only buttered the pan. I only have 9.5″x7.5″ glass baking container..
Hi looloolooweez! Yes, I am the same and use the internet and a couple of food blogs and sites for those recipes. However, this reading challenge is forcing me to cook more from my cookbooks. I’m envious that you got to go to a signing and got lemon squares too. I really hope Deb makes another cookbook soon. Thanks for the comment! 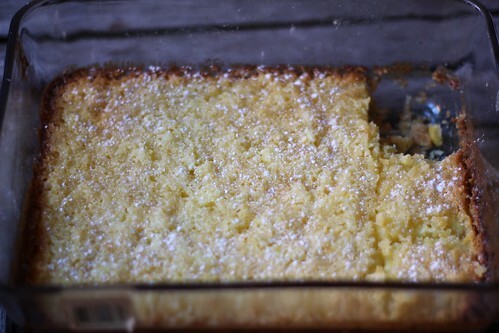 Lemon bars make me drool. Will definitely check this out!